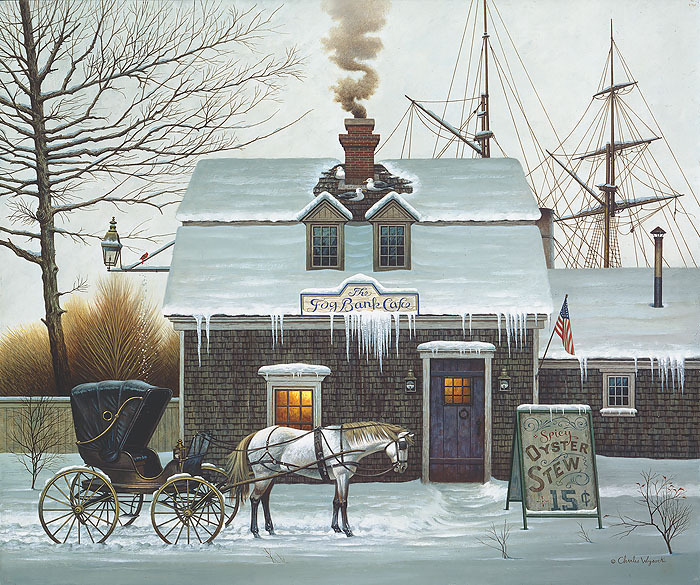 Come in out of the cold into the happy glow of Charles Wysocki’s Belly Warmers. In this charming seaside scene, a ship has found a ship has found a snug berth in the harbor and travelers have found a bellywarming oyster stew at the Fog Bank Cafe. Bright against the soft white snow is a red Cardinal and one window of the cafe beckons with a golden light. But where is the warmest spot of all? Cast your eyes up to the cafe's roof and there you will find three seagulls who are in on the secret!